As a result of society's increasing concern for ecological and environmental issues, the demand for more efficient ways to utilize heat and energy is rising. The heat pump industry uses technological advances such as year-round space heating to displace heat energy to a more useful location and purpose. This concept is accomplished by providing localized or redirected heat, while exchanging cool air with heated air. The principles of heat pumps are actually the reverse of the technological and thermodynamic principles of an air conditioner unit. The majority of heat pumps give the added benefit of providing both heating in the winter and cooling in the summer. This can be accomplished simply by reversing the flow of the working fluid circulating through the coils. The heat pump is an entire thermodynamic system whereby a liquid and/or gas medium is pumped through an assembly where it changes phases as a result of altering pressure. Although relatively costly to setup, the heat pump system provides a more economical and efficient way to control temperatures and reuse existing heat energy. The manufacturing of heat pumps involves the use of large iron castings with stainless steel components and aluminum tubing. The castings, used in the pump and motor, will often have small amounts of nickel, molybdenum, and magnesium to improve the mechanical and corrosion-resisting characteristics of the casting. In smaller heat pumps, some components require the use of alloy steel to reduce weight. Depending on what type of working fluid is used (ammonia, water, or chlorofluorocarbons), the piping in the heat pump system may require corrosion resistant stainless steel or aluminum. In systems where consistency of thermodynamic properties are more critical, copper tubing may improve efficiency. Housing most of the components of the heat pump, the encasements are fabricated out of mild carbon sheet steel. The rest of the piping, fittings, valves, and couplings are stainless steel. All heat pumps require a working fluid to transfer excess energy from one heat source to another. Traditionally, chlorofluorocarbons (CFCs) have been used as working fluids because of their superior thermodynamic properties. Because of the harmful effects CFCs are now known to have on the environment, they have been gradually phased out of production. Instead, water, hydrocarbons, and ammonia are frequently utilized in heat pump systems despite their lack of efficiency in some heat pump designs. 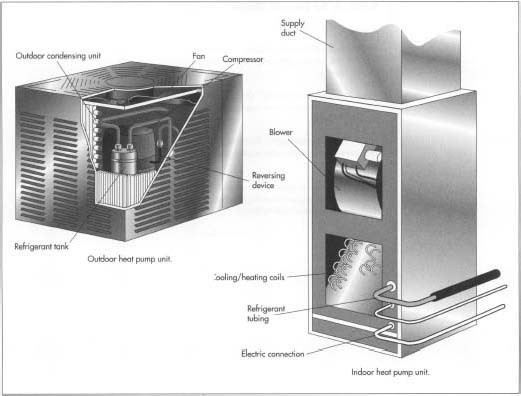 Heat pumps all have the same basic components. These components consist of a pump, a condenser, an evaporator, and an expansion valve. Despite the relative similarities of these components, heat pump designs vary greatly depending on the specific application of the pump. The two major designs, vapor compression and absorption, utilize different thermodynamic principles, yet both include similar components and provide similar system efficiencies. Heat pumps demonstrate remarkable versatility in providing both air conditioning and heating in the same system by simply reversing the direction of flow of the working fluid. In this regard, heat pumps eliminate the need for dual systems in order to maintain a desired temperature. However, this will be costly as it requires a system that is able to pump in both directions. In extremely adverse climates, heat pumps lose some of their effectiveness and may require an additional heat source. This supplemental heat can come from geothermally heated water or electric heaters. 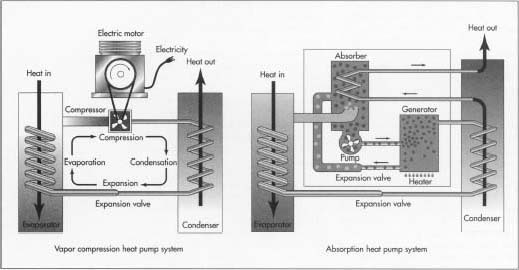 The typical heat pump operation uses the working fluid to receive heat from a source positioned close to the evaporator. At the evaporator, the fluid vaporizes into a low pressure vapor. Upon entering the pump, the vapor is compressed to high pressure and enters a condenser which returns the vapor to a liquid and ultimately gives off its stored heat to the desired source. An expansion valve then allows the system to return to its low pressure liquid state, and the cycle begins again. The pump is usually procured as a finished unit and installed into the system by integrating it with coupling and piping components. Designed for the specific size and fluid requirements of the system, the pump may be shipped, depending upon its size, directly to the installation site. This usually occurs with large commercial heat pumps supplying heat and/or refrigeration to office buildings. Smaller residential models may have the pump installed into an assembly that includes the condenser, evaporator, and various piping. These units, encased in a sheet metal box, will be comprised of various subassemblies for the condenser and evaporator in order to bolt every component to the box or to one another. Some of the brackets used will form the base of the unit where the pump will be bolted down to a metal pan and connected to an AC motor. 1 Assembled from several different sheets of metal, encasement units are sheared to size in a shear press. After they are cut to the proper dimensions, small assembly holes are punched in the metal using a Computer Numerically Controlled (CNC) punch press. These punch presses have either a moveable table to move the sheet metal or a moveable die which is able to punch holes in different spots of the metal. Punch presses are often directed where to punch by a computer-aided design (CAD) program. Different shaped punching tools are stored within the machine, providing it with the ability to punch all of the necessary holes by simply changing the computer program. 2 After punching, the sheet will move to a Numerically Controlled (NC) press brake, where it will be bent in different shapes and configurations. The press brake bends the metal into many different shapes by using dies or tooling. Unlike the CNC punch press, the press brake will require a manual change in tooling to perform a different bend. The sheet is then ready to be welded, riveted, or bolted to the other sheets and brackets. Once assembled, these sheets provide most of the stability of stand-alone units. 3 The condenser and evaporator are made of many small, thin copper or aluminum tubes, which are bent around curved dies by tube bending machines. NC tube bending machines will be programmed to provide the same exact bend on each of the tubes, allowing them to be stacked one on top of the other. These tubes will then be attached to plates or fins through which the tubes will pass and be joined through tube expansion or joint welding. This creates a tightly sealed system. The tube and plate assembly will act as a heat exchanger by allowing the working fluid to pass through the system inside the tubes, while giving off the heat in the condenser to another fluid medium passing between the plates and acquiring the heat given off through the tubes. 4 In order to provide strength or connectivity to the components, small brackets are punched out of mild carbon steel. The brackets are usually punched out of steel coil that is continuously fed first through a decoiler. Once it is decoiled, it is sheared, bent, and formed in one continuous process. This is done with a progressive die configuration, where the bracket remains attached to the coil as it moves from station to station. Each station adds something to the bracket, either a hole or notch, and sends it to the next station, until finally it is sheared from the coil. This process may be outsourced to vendors who specialize in progressive die or transfer press operations and can provide better cost control. 5 More tubing is fabricated and bent to provide the rest of the piping needed to connect the pump with the condenser and evaporator. Various fittings and connection components are utilized. The expansion valve, which is contained within some of the piping lines, is another component purchased as a whole unit. The expansion valve is a designed fitting that provides for the expansion of the working fluid and connection of smaller diameter tubing with larger diameter tubing. In small residential units, the valve is contained within the main box, while in larger commercial units, it may be installed on site in the piping system. 6 Components, subassemblies, brackets, and/or plates are painted or powder coated for corrosion resistance. Before painting, however, some parts are treated with a special solvent to remove any grease or oil left from the manufacturing operations. This is usually done by submersing the parts in large tanks filled with solvent and then drying them in a special oven. Some parts, which are specially coated with zinc, nickel, or chrome, will be fed through an acid bath before being dipped into tanks of coating solution. Once cleaned, the parts are manually loaded onto trays or hung on specially designed racks and fed into a paint booth. The paint is applied with a pressurized paint dispenser that will spray paint into each crevice. 7 After passing vigorous inspections, the heat pump is sent to packaging, where the system will be boxed and shipped to the installation site. with a large DC motor or natural gas generator. The fittings and valves will be shipped and installed into the piping system, while supported by brackets and braces anchored to existing walls. These installations exhibit significant engineering challenges and often require cooperation between the contractor and heat pump manufacturer. Each component that is procured from an outside supplier will usually be inspected for dimensional compliance before being assembled. Other components will be checked during their fabrication to ensure quality. The final assembly will then be tested by filling it with the appropriate working fluid and connecting the system to a power source to turn the pump. By measuring, with transducers or switches, the temperature and pressure levels of the fluid in different stages, the final system can be checked against predetermined criteria. With the rising energy costs, the demand for the efficient heat pump will increase. The high initial cost will be returned in full as overall energy use decreases. The versatile heat pump will benefit organizations that aim to increase their exposure to new technological developments. As technology improves, the heat pump will ultimately produce more cost effective heating and cooling. Product development will generate competition among industries, causing the high manufacturing costs to decrease. Working fluid technology will continue to expand due to several experimental studies designed to meet future environmental concerns. "HydroHeat Geothermal Systems." October 4,1996. http://www.njhpc.org/njh_uses.html (July 9, 1997). "Heat Pump Working Fluids." October 1996. http://www.heatpumpcentre.org/hpcwrkf.htm (July 9, 1997). "Heat Pump Technology." October 1995. http://www.heatpumpcentre.org/hpctek.htm (July 9, 1997). "Heat Pumps in Industry." October 1996. http://www.heatpumpcentre.org/hpciapp.htm#industrysystems (July 9, 1997).